I've had a fascination with Chinese cuisine since I was a child. But in all my years as a lover of Chinese food, I had never been part of a Chinese New Year Feast. I figured that they just lit up some fireworks, did a Dragon dance, then ate some noodles and Peking Duck, then found someone to kiss at the stroke of midnight. Although I'm pretty sure i'm not far off from the truth, something I had absolutely no clue about, was the tradition of the "Prosperity Toss". 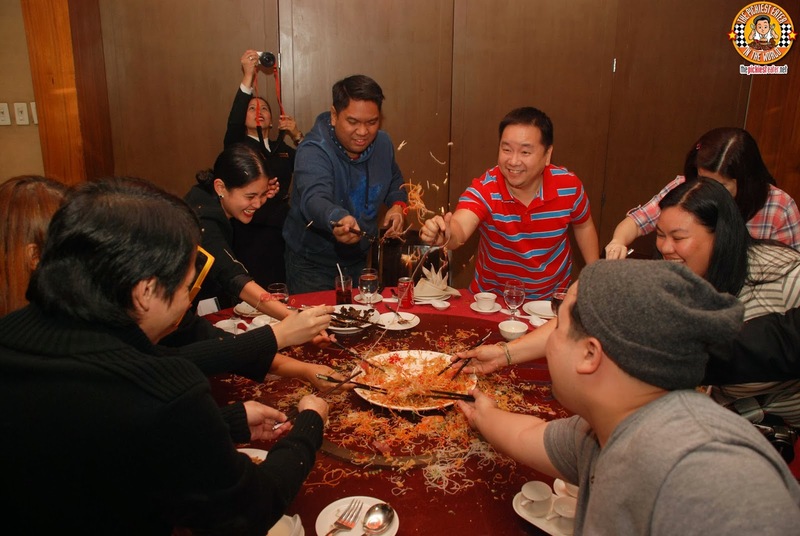 Good thing for me, my friends from Crowne Plaza Manila were more than willing to show me what that grand tradition was all about, at their delicious Chinese restaurant, Xin Tian Di. Rina had just witnessed the Prosperity Toss just the week before, and was eager for me to witness the "ceremony" for myself. I was thankful that I got a chance. 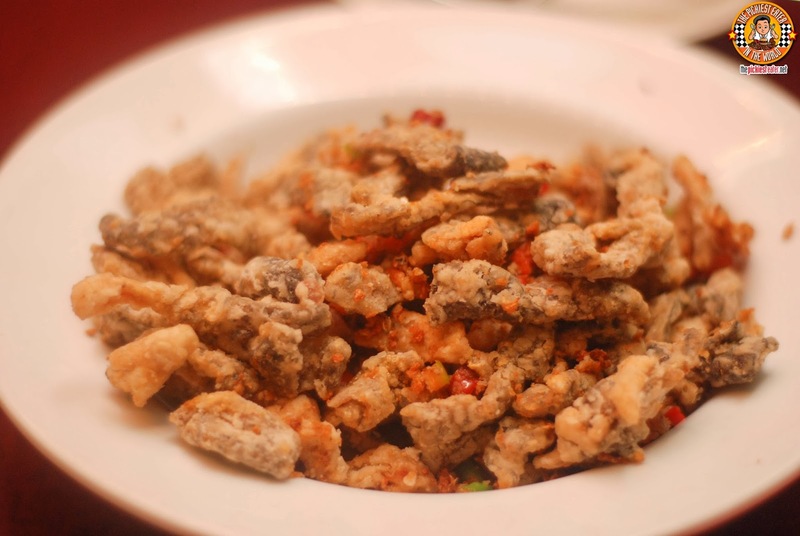 As we waited for the meal to begin, we treated ourselves to handfuls of Deep Fried Salmon Skin. They were seasoned just right so it gives out a light spicy kick to go with the the fantastic crunch. 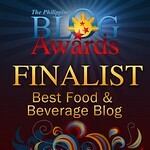 This is actually a great, and less fattening version of Chicharon.. I was even contemplating eating this with rice. 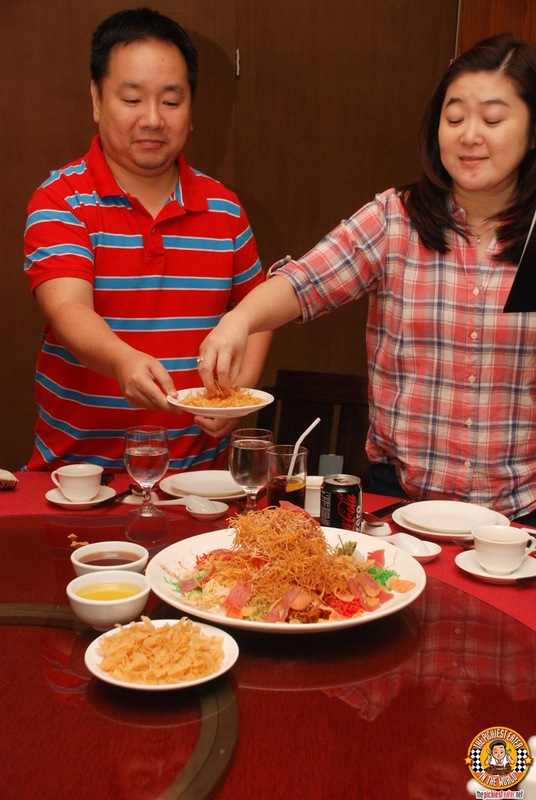 Our evening began with our lovely host, Aimee, going through each step of the traditional "Yu Sheng Salad Toss". 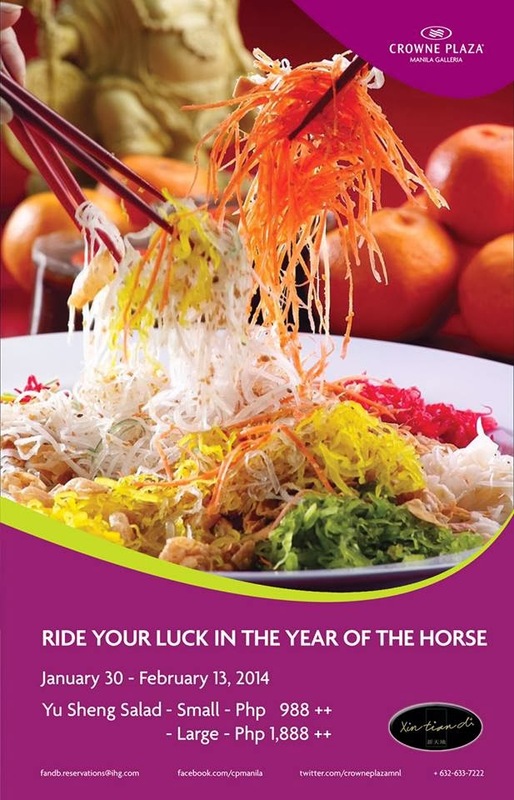 The first step was to Greet Everyone in the table “Gong Xi Fa Cai” or “ Wan Shi Ru Yi", which roughly translates to "Congratulations for wealth or may all your wishes be fulfilled." I was blessed to be among friends and people with good vibes so doing that was a breeze. 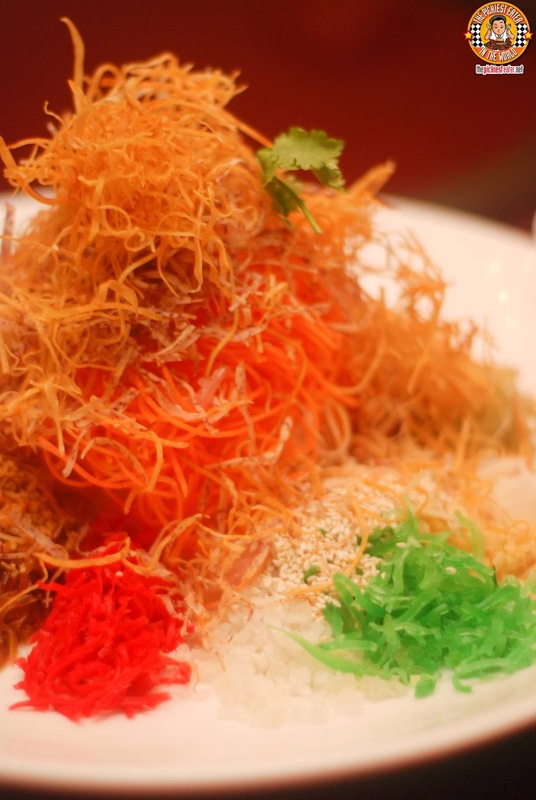 Next, Lime was sqeezed around the raw cuts of fish, then place on to the Yu Sheng salad, as we uttered the words, "Nian nian, you yu" & "You yo you sheng". The lime symbolizes good luck, while the fish represents "abundance throughout the year". 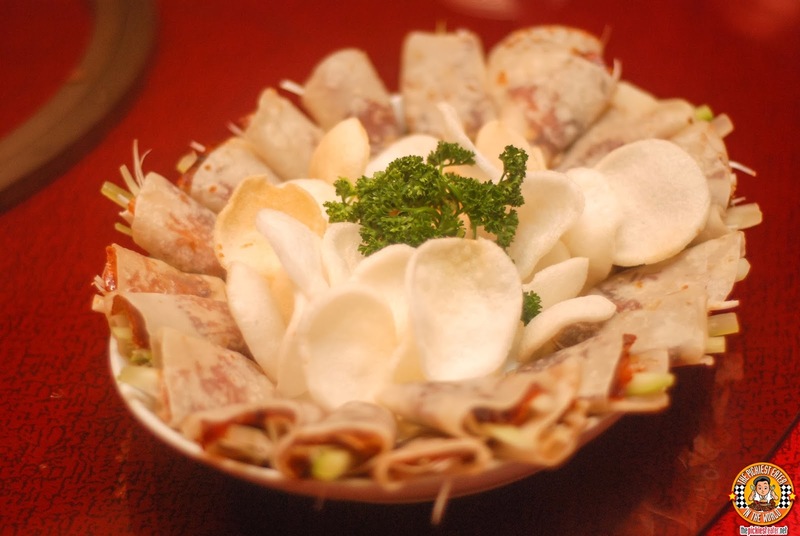 For the third step, we tear open the green and red packets containing Pepper and Cinnamon, pour it on the salad in a circular motion, uttering the words, "Zhao Cai Jin Bao". This portion is with hopes of attracting more money and valuables. For the fourth step, we then add the other condiments, such as sesame seeds and deep fried flour crisps. I'm glad they told me that the crisps were for the ceremony before hand, because I had every intention of munching on them while waiting for the guests. This time, the words we said were, "Jin yin Man Wu", and Pian Di huan Jin". This signifies success in business, and a household filled with gold and silver. After everything was piled on to the salad, we then moved to the fifth step.. 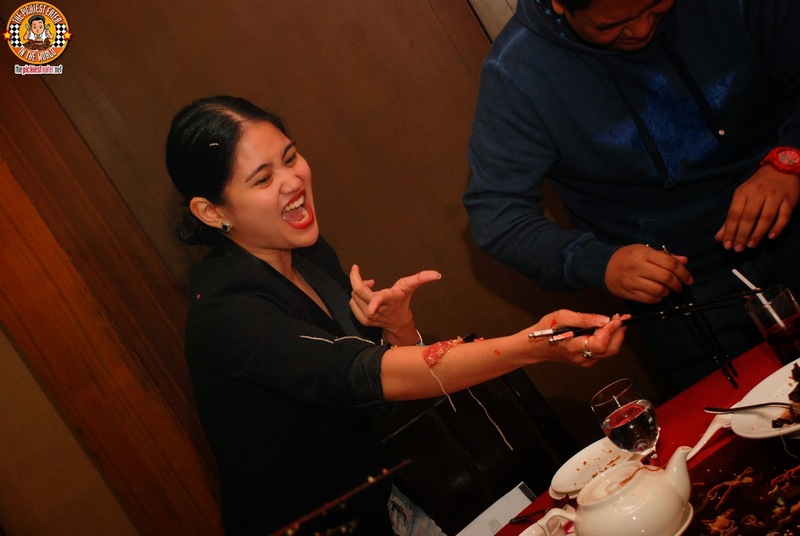 Which was the pouring of the plum sauce and oil in a circular motion, while saying the words, "Yi ben wan li", and "Cai yuan guang jin". This is in hopes of increasing all profits 10,000 times and to encourage money to flow in all directions. Then it was time to go nuts. We all then grabbed our chop sticks for the final step. 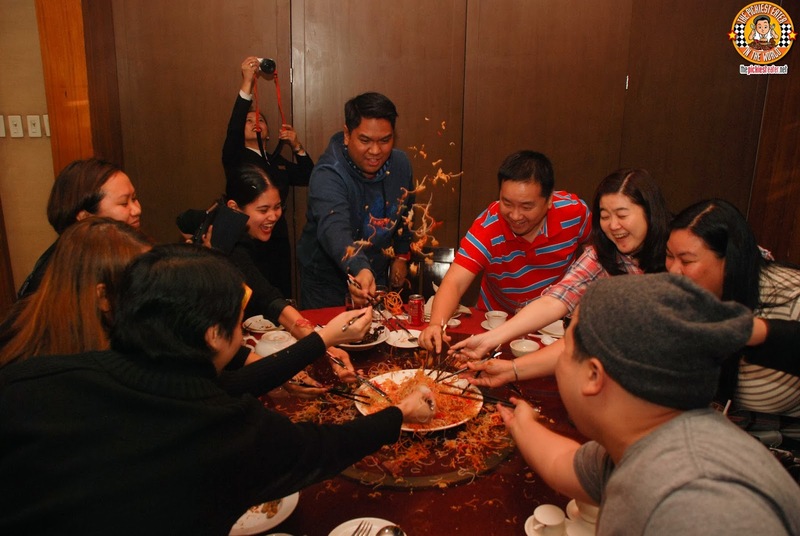 We chanted "Lo Hei" while tossing the salad seven times as high as we could. 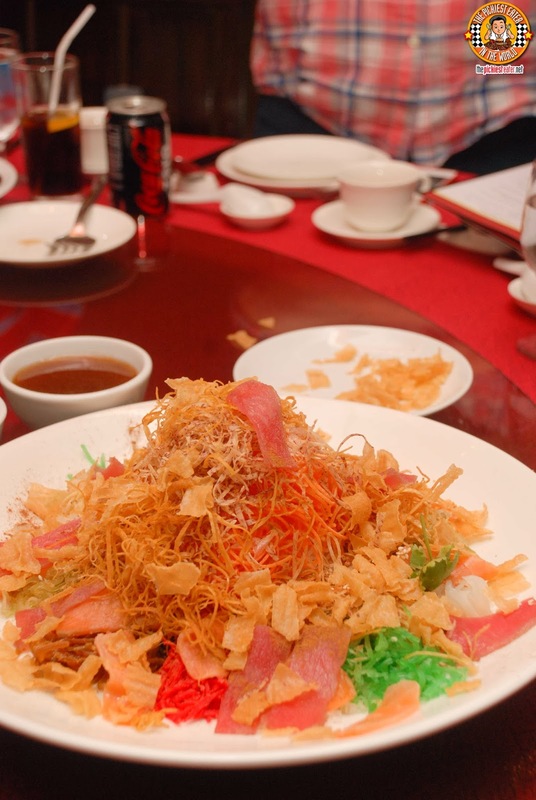 "Lo Hei" is actually Cantonese for "Tossing Luck". Umm... I think my throw was a little bit too exuberant..
Because the next thing I knew, Aimee was screaming because someone threw a piece of fish that landed on her forearm! Umm.. Naturally, I pretended I didn't know what happened. When we were through, the table looked like it got hit by a meteor. There was salad everywhere (yes, including Aimee's arm)! Afterwards, we had to eat from the plate, and guess what? It was good. I'm serious. It was darn good. It was crunchy and there was a touch of acid that bonded with a subtle sweetness, making it very addicting to eat. 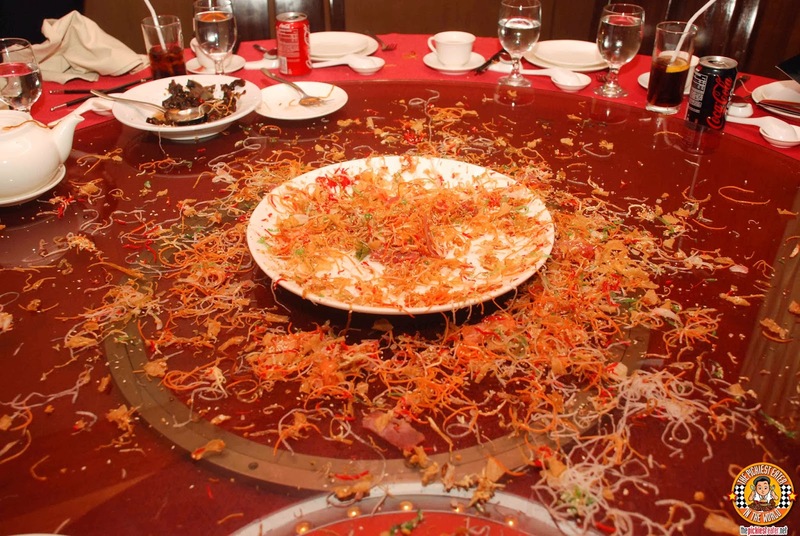 We made such a mess, the waiters decided it would be much easier for them to just change the entire lazy susan than wipe everything up! After everything was cleaned up, we got back down to business.. The lovely Janice, who has hosted several of Crowne Plaza's Chinese New Year Dinners through the years, took the liberty of kicking off our dinner with the Peking Duck done two ways. Even just by looking at it you knew that the skin was going to be phenomenal. Strips of Skin and duck meat were wrapped into the wrapper, with a dabbing of hoisin sauce and a sprig of spring onion and cucumber (which i removed hehe). Everything about this to me was amazing. 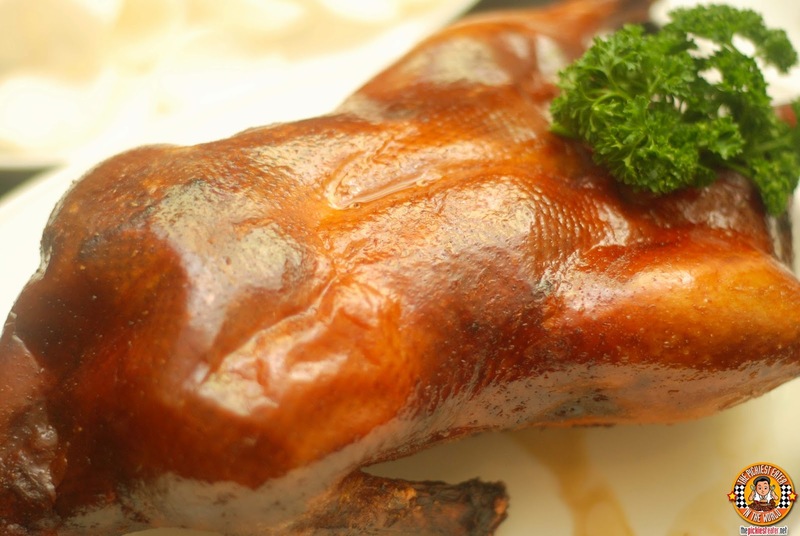 The crispiness of the duck, the savory flavor of the meat that was complimented by the hoisin sauce.. Even the darn Kropek was good! 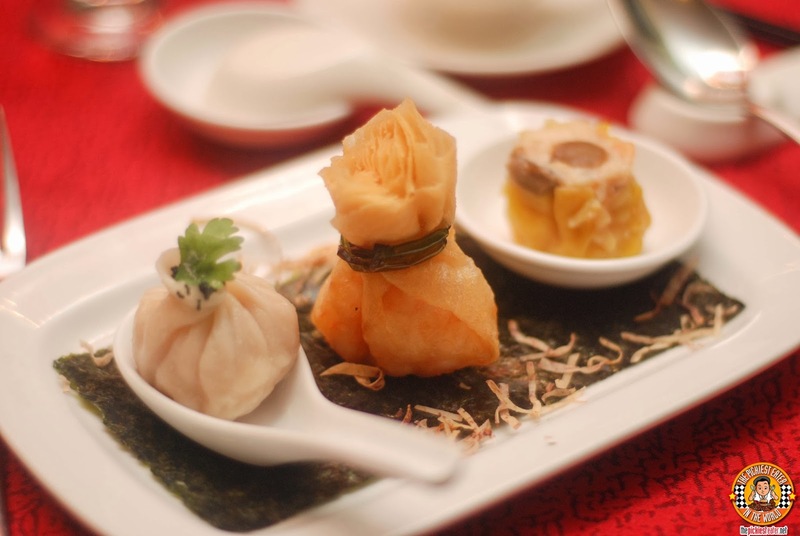 The Dimsum Platter featured a delicious Siomai with Baby Abalone (for good fortune), and a mixed seafood with celery dumpling (symbolizing happiness) and Fried Po Pya (symbolizing good fortune). Of course it was Rina who ate the Fried Po Pya because it contained shrimps. It was sort of like hakaw inside. So naturally she loved it. 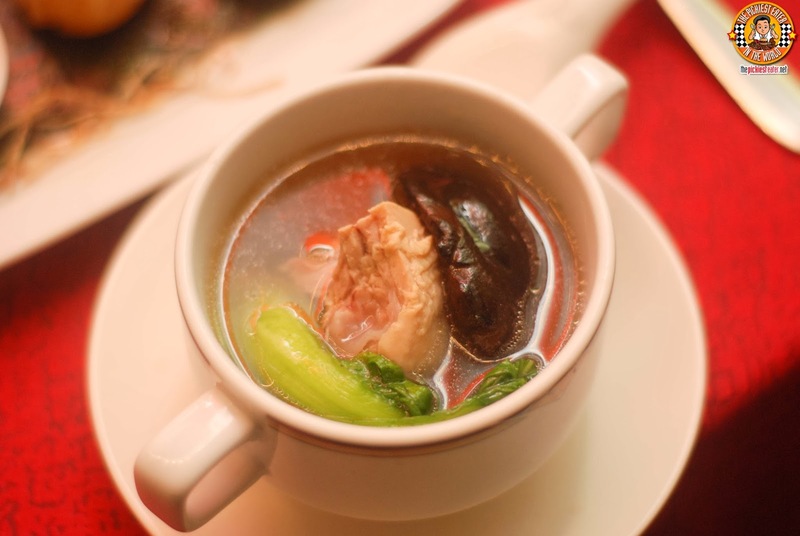 The Double Boiled Chicken with Black Mushroom (symbolizing good marriage) soup had a thin yet flavorful broth, filled with delicious chicken meat, and a huge mushroom, and a medley of fresh vegetables. 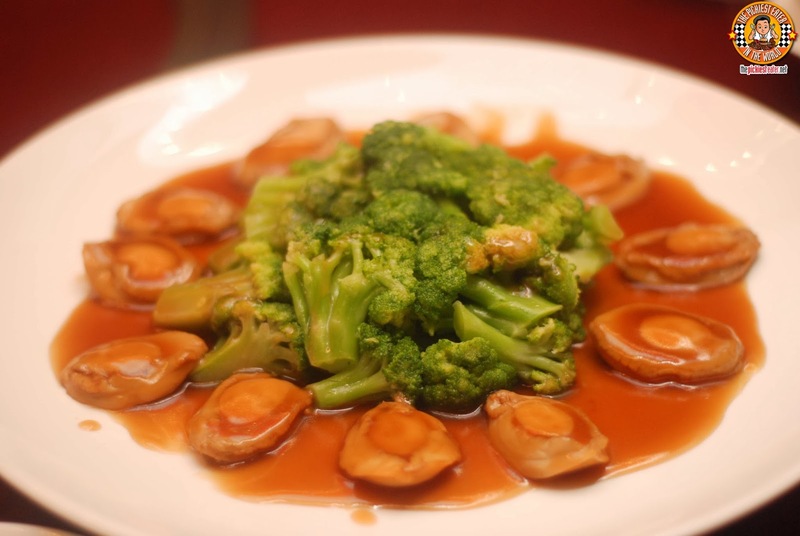 I don't eat Abalone, but Rina has been intrigued with this Braised African Abalone with Brocolli in Oyster Sauce. This was her second time to eat Abalone and she quite liked the sauce and the broccoli. 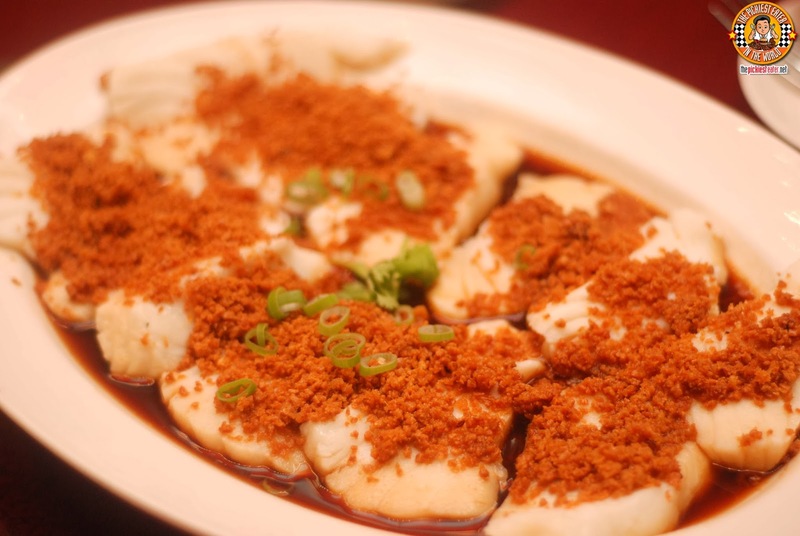 The Steamed Cod Fish Fillet with Taosi was fantastic. The meat itself was so delicately tender, it virtually melted in your mouth, and the sauce it was bathed in gave it a gentle notes of both sweet and salty. What's even more fantastic is that during Chinese New Year, it is believed that eating fish will make your heart's desires come true in the year to come. 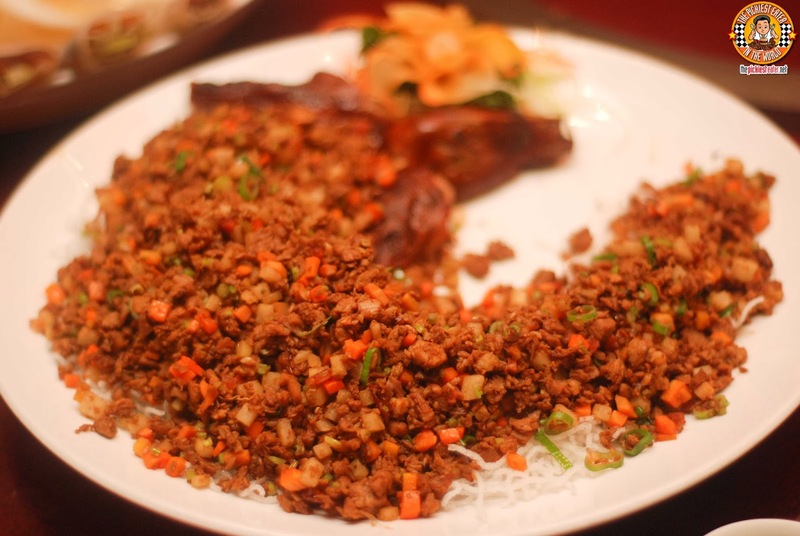 The waiter came back with the second style of the Peking Duck, which was minced and stir fried, and laid on a bed of crispy rice noodles. This is supposed to be eaten in a lettuce cup, but me being me, I decided to mix in some hoisin and eat it with rice. 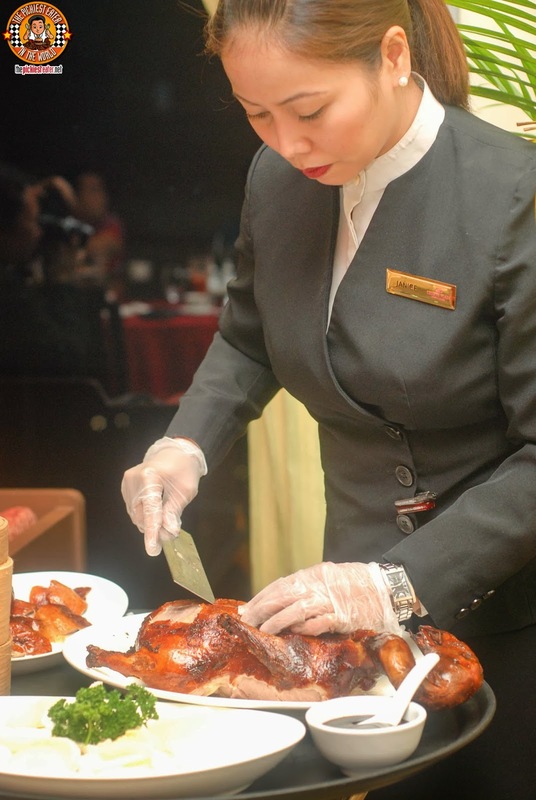 Peking Duck is served during Chinese New Year or Weddings because Red is the color of happiness. 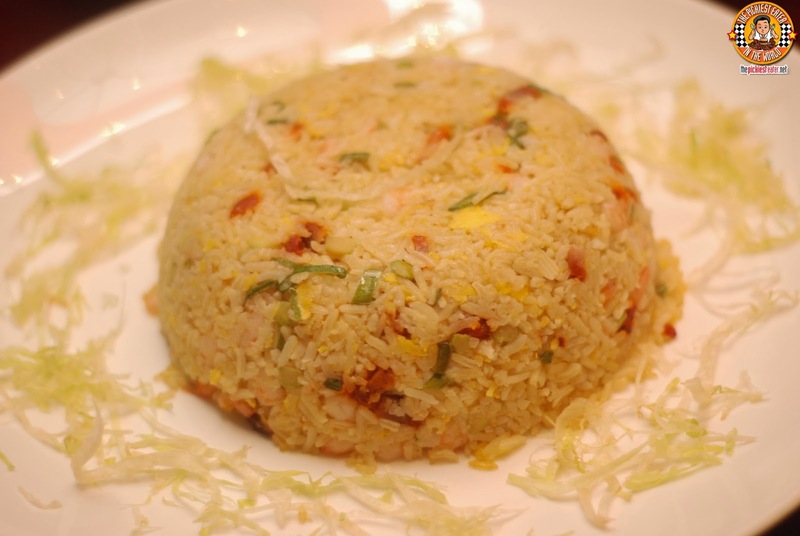 Trust me, if you were served Yang Chow Fried Rice this delicious, you'd want to eat all your entrees with it as well. 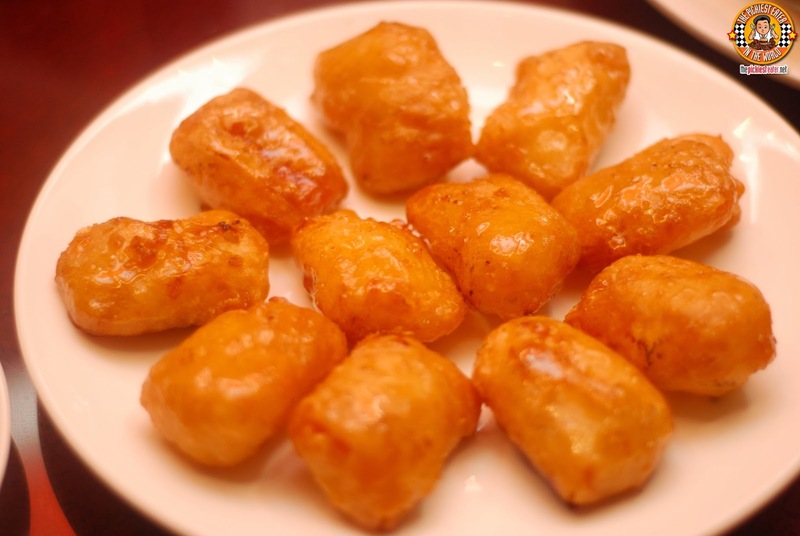 No Chinese New Year feast is complete without some celebratory Tikoy. 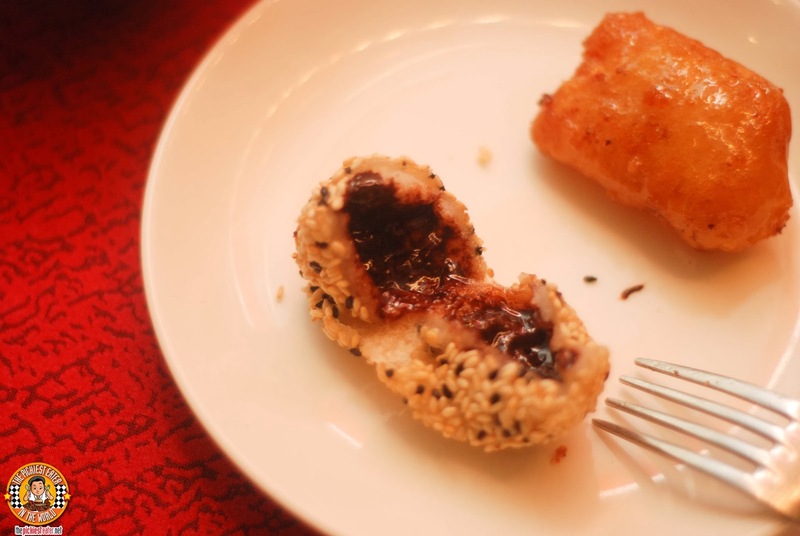 Crowne Plaza's Crispy Tikoy had a golden outer crust that revealed a stunningly sticky rice flour inside, that had gentle sweetness that I commanded my hand to grab a few more pieces. Tikoy symbolizes a promise of a better year. The Chocolate Buchi however was really the one I was looking forward to. 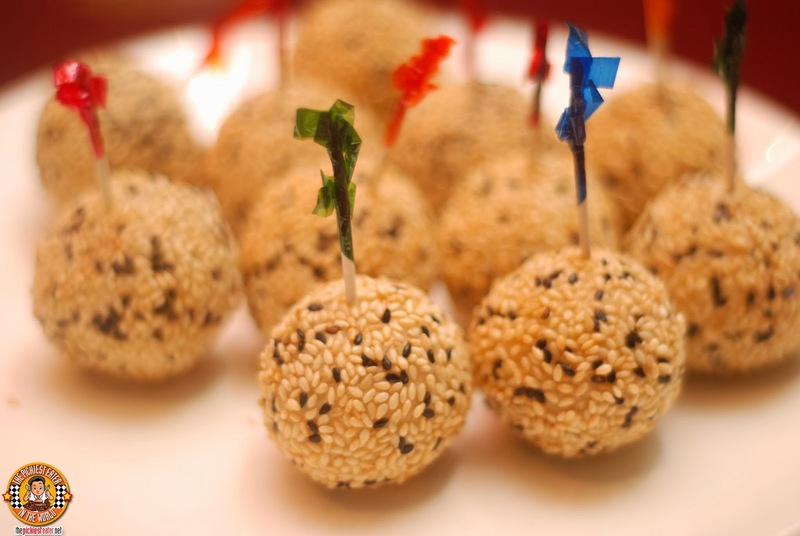 Buchi symbolizes gold coins for wealth and good fortune. It's stuffed with some really good chocolate filing inside, almost dark-ish, that bursts in your mouth! Rina, wanting to get into the spirit of things, asked how to say "Happy New Year" in Chinese. She was told it was "Kong Hei Fat Choi!". Since everyone was talking at the same time, i'm guessing she didn't hear clearly, because she looked over at me with a big smile on her face and said, "Kung Hei Fat Boy!". She said It was an accident. Not sure if I believe her. 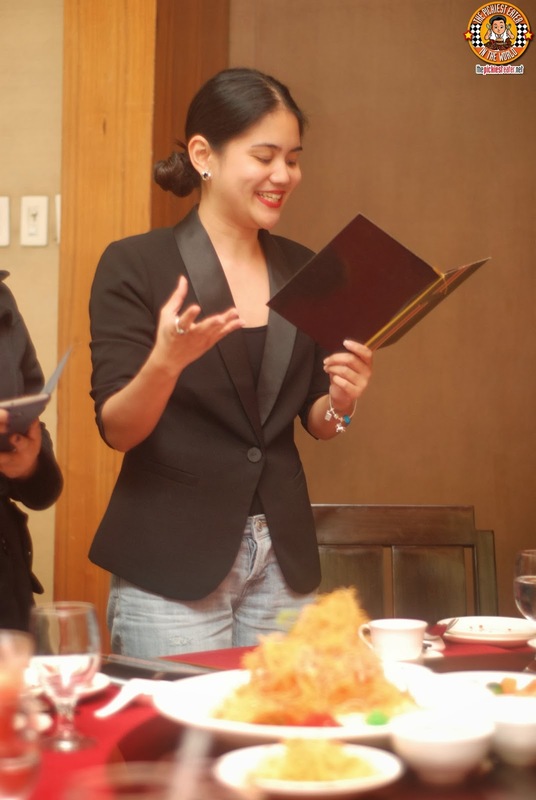 Thank you to Crowne Plaza for my very first Salad Toss experience. 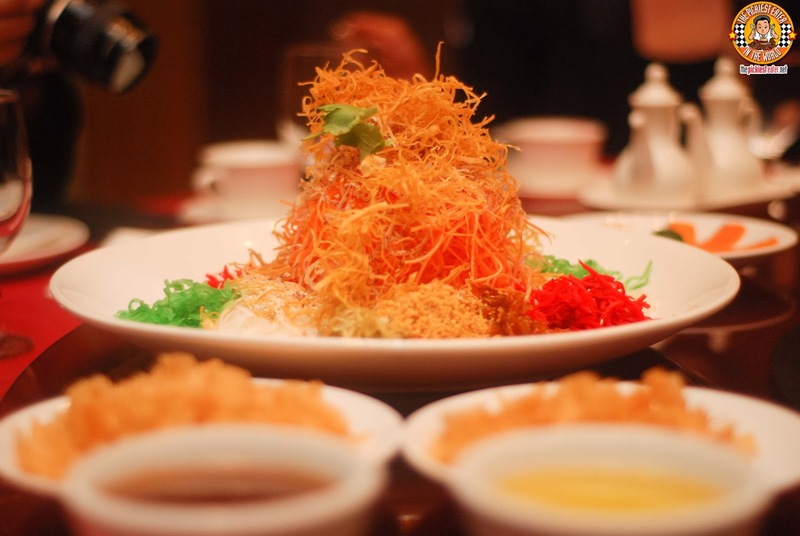 It was definitely a memorable meal for me, and a wonderful way to celebrate the Chinese New Year! Advance reservations required, please call 633.7222 or email fandb.reservations@ihg.com. Hahahahaha I'm sure it was meant to be Fat choy and NOT fat boy! ;)) You're too hilarious for my life Richie! haha i dunno if i believe her because she was laughing when she said it! I wasn't planning on eating it either, but Rina said I had to, for prosperity!